I was interviewed by ‘Crime Thriller Fella’ this week about my new book Chasing the Game and my writing regime in general. A link to the interview on the excellent Crime Thriller Fella website can be found here. A transcript of the interview can also be found below. Crime Thriller Fella writes screenplays and novels, and reviews crime movies, TV shows and books for his blog, as well as providing interviews and latest news. 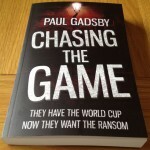 For more details about Chasing the Game, a fictional take on the real-life theft of the World Cup trophy in London in 1966, please click here. Here is the interview transcript. . .
We love writers with synchronicity. 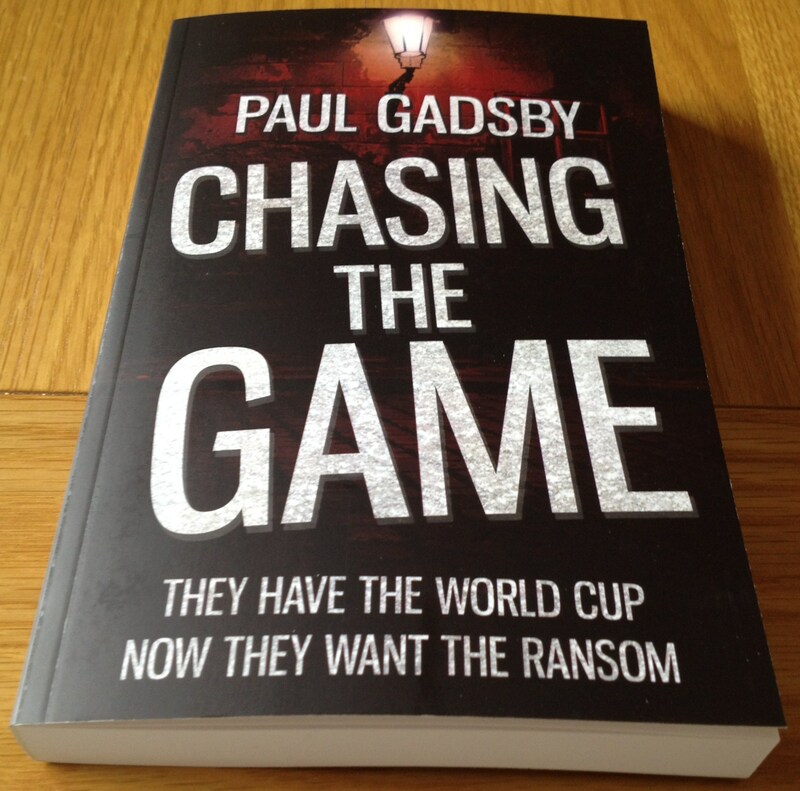 Paul Gadsby’s novel about the true-life disappearance of the World Cup trophy is released with the 2014 tournament just round the corner. Paul is a journalist and writer. Having worked in sports, news and trade journalism for 14 years, he’s the co-author of the seminal snooker book Masters of the Baize. 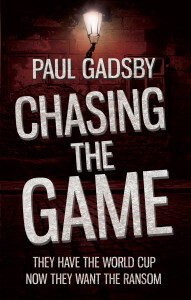 Chasing The Game is his first crime novel, and you can buy it right here. Paul gives us the lowdown on an intriguing unsolved mystery – and, of course, his writing regime. Chasing The Game is based on the true story of the disappearance of the World Cup trophy in 1966 – what happened? It’s a fascinating story – one that has a dose of crime, shame, desperation and intrigue in roughly equal measures. The World Cup, or Jules Rimet Trophy as it was known, was on display in Westminster Central Hall in March 1966, three months before the World Cup tournament was due to begin. The stakes were high because the Football Association (FA) wanted the event to go very smoothly, it being the first – and so far only – time England have hosted the World Cup. But one Sunday lunchtime the trophy was stolen from its display case. A few days later a ransom demand was made to the FA, and a note later delivered setting up a rendezvous where the trophy would be exchanged for the cash. But the plan fell apart, the switch never took place (despite coming tantalizingly close) and the thieves were never identified. The trophy, for reasons unknown, ended up under a bush in a London street where it was discovered by a dog named Pickles a week after the theft. Pickles briefly became a national hero, praised for sparing England’s blushes and saving the reputation of the World Cup tournament as a brand. How closely is your novel based on true events? Pretty closely in many ways, which is why I didn’t go into too much detail above! I always wanted this project to be a work of fiction, though, so certain elements – the nature of the theft in particular – were dramatised in order to drive the narrative. I kept certain characters such as the chairman of the FA (although I changed his name and created my own persona for him) while the gang of thieves was entirely down to my imagination. I’ve always felt the theft had an organised criminal element behind it, but not a large scale one, so it was fun creating a ‘firm’ who could carry out the raid but were under real pressure to collect the ransom because they desperately needed the cash. Pickles is the only character that maintains his real-life name. In 1966 there was also a replica of the trophy made, commissioned by the FA but against FIFA’s wishes, and I exploit this conflict in the story. I’m a big fan of blending fact with fiction (David Peace and James Ellroy being the masters at this) and have always felt authors should be encouraged to use fiction as a vehicle to enhance intriguing factual narratives and sharpen the motivations of characters or historical figures. What drew you to the story? The curious nature of the theft, the bizarre discovery of the trophy, and the fact that the crime remains unsolved. Who were the gang of thieves? What went wrong between them to result in the trophy, worth a significant amount of money, ending up under a suburban hedge? I was surprised that no one had taken the Pickles story and done something exciting with it, so I thought I’d jump in there and weave my own narrative. I also tied this in with a theme I’d been toying with basing a crime novel on for a while – leadership, and the pressures that come with fronting a criminal enterprise or firm. I’ve always been fascinated with the internal struggles and conflicts that crop up within a systemised criminal set-up, and seeing people try to take on the skillsets required to fill certain roles. So the tense and complex professional relationships that exist between members of the gang make up a central theme of the book. I wish I had more of them! I write around a day job (I write copy for a marketing company) and am married with a three-year-old son, so my blocks of time for creative writing can be varied and unpredictable. On the occasions when I have a few hours to write, I begin by (and most writing guides advise against this) doing a light edit of what I’d written previously. I trained and worked in journalism for a few years and the editor in me just can’t resist, but I do enjoy ploughing on with a first draft knowing that the product behind me is a strong one. Obviously the second draft stage is always an extensive one, but I don’t want a major re-structuring job at that point; I’d rather fix problems and enhance areas as I go along. I’m also a big fan of Stephen King’s theory of ‘write with the door closed, rewrite with the door open’ so I’m very much in my own head when unleashing a first draft, then liaising with friends and fellow writers for feedback on the second draft. 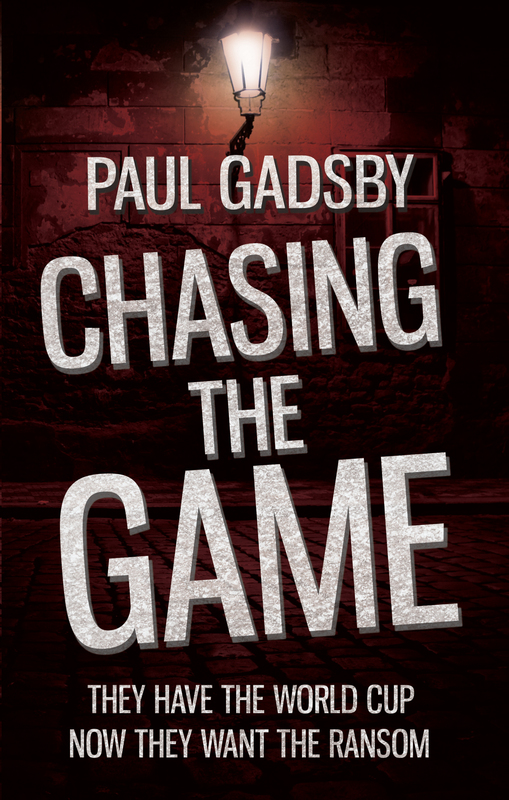 Chasing the Game is my first published novel but I wrote three crime thrillers before that; I’ve been writing seriously since about 2005 when I had a non-fiction book published and got the bug for writing full-length works. Who are the authors you love, and why? I adore Elmore Leonard’s dialogue, Adrian McKinty’s action sequences, Ken Bruen’s humour, the powerful prose of James Sallis, Jake Arnott’s deep characterisation, Patricia Highsmith’s ability to build drama, James Crumley’s sense of time and place and Graham Greene’s story structure. James Ellroy, David Peace and Don DeLillo do a glorious job of mixing fact with fiction while I also love Ian Fleming’s Bond books. As remarkable standout thrillers I really enjoyed Eddie Bunker’s No Beast So Fierce (which apparently inspired Tarantino to write Reservoir Dogs) and The Ice Harvest by Scott Phillips. Probably the fact that it’s incredibly difficult – and increasingly rare – to make a full-time career out of it. At a recent writing event I had a chat with an established, award-winning author who’s terrifically talented but told me how many copies her last book had sold and how many other things she had to do in order to supplement her time to write, and I thought that was a shame. The less time an author has to write, the fewer chances we have to enjoy them. On a technical point, I like writing a synopsis but find it bizarre, frustrating and amusing that every agent and publisher appears to have a different idea about what they want to see in one. It’s an area that takes subjectivity to a new level! I embrace it during the editing stages of my writing. An interesting point is what to do with all the feedback you collectively receive. I know some writers who literally change everything that is recommended from all sources, but the danger of this is that the focus of the manuscript can then fragment and before you know it you have several half-realised themes and sub-plots going on. I don’t think an author should ever lose sight of the initial purpose they had at the onset of the project. I think it’s best to take all feedback on board, apply a great deal of it if necessary, but to always consider that this is your book and the reader has to be convinced that it has come from one soul. As for feedback from the industry, rejections are a familiar tale and for me have always been tempered by the fact that you know thousands upon thousands of writers are going through the same thing. Many writers collect their rejection letters but I’ve never really gone in for that. Positive responses from the trade, meanwhile, are obviously fantastic; it’s great to spend time speaking with agents, publishers and authors, and when you’ve had your work praised by such people it comes as a relief as well as a joy. Tough one. Any advice given by writers is obviously going to be very personal to them, but I’d say the most valuable way to spend your time is to focus on both finding your own distinctive voice (there’s no better way to make an impression on your first page) while at the same time reading as much of other writers as you can. If you’re writing a full-length novel you need prose worming through your brain pretty much all the time. The passion to write can only be driven by the passion to read. I’ve written a first draft of another crime novel, which I’d like to polish and edit in the near future. It has another sports link, and is about the physical and mental struggles of a recently retired boxer who gets dragged by his former manager into a murky world of crime and an underground bare-knuckle fighting circuit, while also struggling to deal with his Alzheimer’s-stricken father. It’s called When the Roar Fades. Who’s going to win the World Cup this summer? All World Cups previously held in South America have been won by a nation from that continent, and I can’t see that pattern changing. It’s hard to see past the hosts, Brazil, but Argentina could be handy. I think England might sneak through their tough group but I’d be surprised to see them go beyond the quarter-finals.